types of posts. My site is called Lipstick Is A Life, so I want to do a bit more about the life aspect. To start off I prepped by rough chopping up my veggies that will be going into the dish. 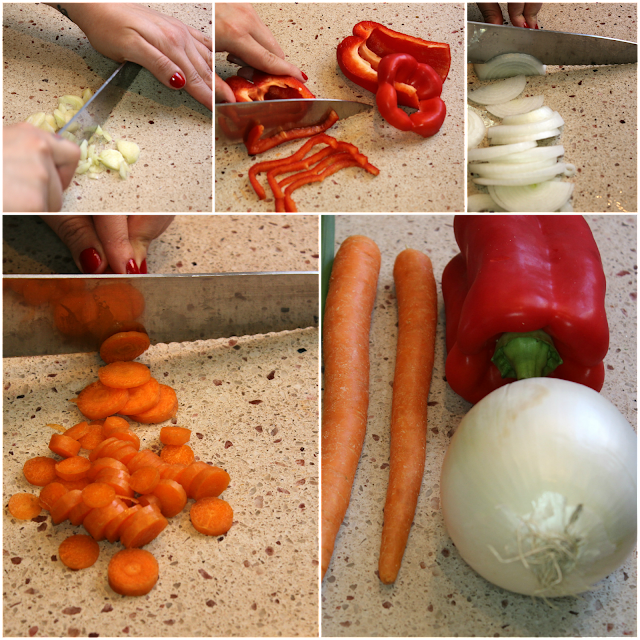 You do not need to be exact when chopping up the elephant garlic, onion, carrots or bell pepper. I like to pre-measure all of my ingredients before I start cooking that way I'm ready to go as things move along in the cooking process. I chopped my green onions (set aside for later). I also pre-measured my spices and my minced garlic. My family always makes bulk amounts of minced garlic since we cook so much. (My dad is a Chef). We put it in a Cuisinart and slowly add extra virgin olive oil as we blend until it is evenly minced. This saves so much time. 1) Start by pouring about 1/4 cup of extra virgin olive oil into a cool, non-stick pot. 2) Warm on medium heat and when the pan is heated add in your chopped veggies. 3) Once that starts to sizzle add in about 1/2 a cup of white wine and put and lid on the pot, over medium heat, to sweat the vegetables. 4) Once the vegetables have softened add in the minced garlic and stir. 5) Add in the raw, sliced sausages and cover over medium heat. 6) Once the sausage is about half way cooked, add in the can of diced tomatoes and stir. 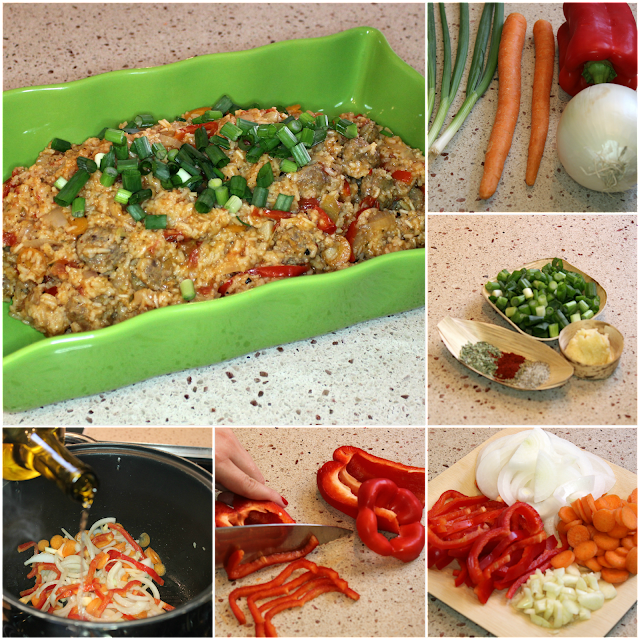 7) Add in the rice and the correct amount of water for the type of white rice you are using and mix in. 8) Turn on high heat until the liquid comes to a strong bubble. Then put the lid on and simmer over low heat for 25 minutes. After 25 minutes taste test and be sure the rice is cooked through. Mine needed about and extra cup of water and another 10 minutes. If you need to do any seasoning adjustments, like adding more salt, this is a good time. Plate and sprinkle with the green onions that you chopped earlier for a pop of color and a fresh taste! That is the finished dish and it nearly cooks itself. I can prep this meal in about 15 minutes and set a timer and forget about it, so it's perfect for all you lovelies who are super busy. and more of myself with you guys. Cooking is a big part of my life since my mom is a former cook and my dad is an Executive Chef. Tell me if you like this type of post and if oyu'd like to see more. I'm trying to get my dad to do a post with me on how to cook an easy meal to impress dinner guests. Fingers crossed!